^ Constance Tipper (researcher into Liberty ship fracture). [2009-09-01]. ^ SpatFree 113 - Silicone free, Non-toxic, Non-flammable , Non-polluting Welding Anti Spatter & Flux. Novel Surface Treatments. [2009-05-14]. （原始内容存档于2009-05-16） （英语）. ASM International. 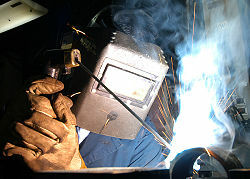 Trends in Welding Research. Materials Park, Ohio: ASM International. 2003. ISBN 0-87170-780-2 （英语）. Hicks, John. Welded Joint Design. New York: Industrial Press. 1999. ISBN 0-8311-3130-6 （英语）. Lincoln Electric. The Procedure Handbook of Arc Welding. Cleveland: Lincoln Electric. 1994. ISBN 99949-25-82-2 （英语）. Weman, Klas. Welding processes handbook. New York, NY: CRC Press LLC. 2003. ISBN 0-8493-1773-8 （英语）.